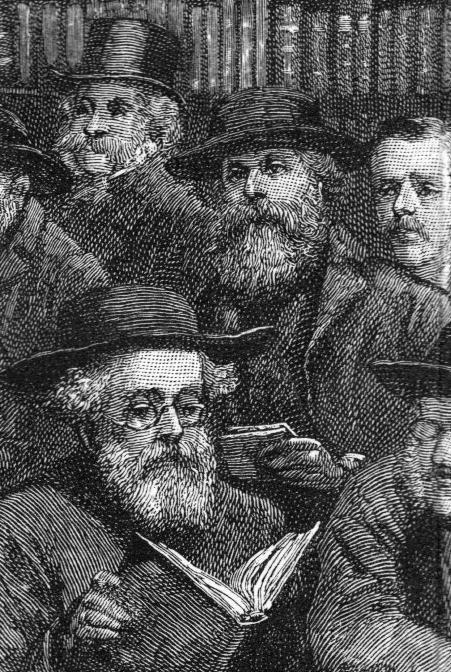 (10) Mr. W. Reeves – seated to Quaritch’s left and puzzling over the quarto currently on offer is the veteran William Dobson Reeves (1825-1907), born into the London book trade over sixty years earlier. His father, also William Reeves, also a bookseller, had married Frances Dobson at St. Margaret Westminster in 1822. 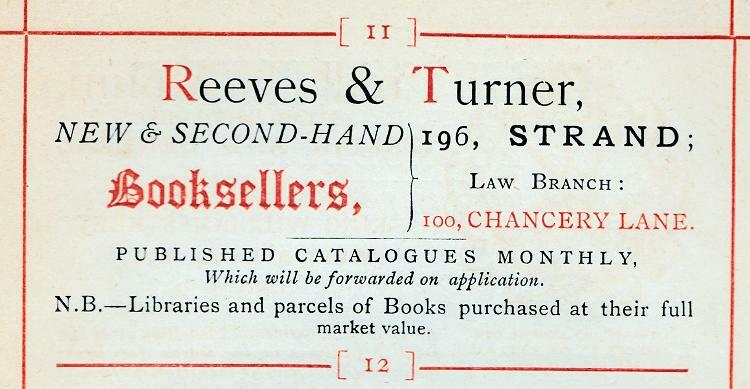 Throughout most of his career, Reeves was in partnership with Osborne Turner (1825-1887), himself the son of a London vellum-binder, trading as ‘Reeves & Turner’. The partnership was established in 1851 and after short spells at various addresses in Chancery Lane, the partners found a more permanent home at 238 Strand in 1856, subsequently moving to larger premises at 196 Strand from 1867 onwards. Between 1867 and 1887 they had further premises at 100 Chancery Lane, where Osborne Turner presided over a separate department dealing in legal books. From the outset the business had encompassed publishing as well as bookselling, building a list that included not just law books, but music, freemasonry, natural history, poetry, some of the books of William Morris, and especially reprints of early texts, e.g. 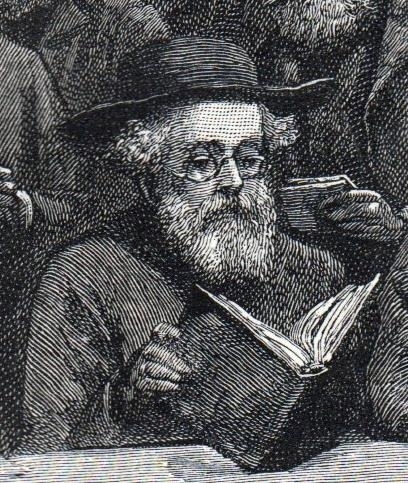 ‘The Old Book Collector’s Miscellany : or, A Collection of Readable Reprints of Literary Rarities’ (1871-1873) – this edited by Charles Hindley, to whom we shall come in turn. Reeves married Emma Holmes (1830-1902), housemaid to surgeon in Clerkenwell and originally from Great Marlow, in the latter part of 1851: another generation of bookselling Reeves was soon on the way. The 1861 Census captures the growing family still living over the shop at 238 Strand, which abutted directly on to Temple Bar, but by 1871 a separate family home had been found at 160 Stockwell Park Road, Brixton. When Osborne Turner died early in 1887 his share in the business was taken on by his son John Turner (1861-1894), until the son’s own death only seven years later. The lease on 196 Strand expired at around the same time and Reeves in his final years in the trade simply shared premises with his son David Eno Reeves (1865-1941), who by now had his own business at 5 Wellington Street, close to Sotheby’s. Writing in 1895, Roberts reminisced about the old shop, which stood on the south side of the Strand, opposite St. Clement’s church: ‘here for about a quarter of a century was a famous book-haunt, and one of the very few successful ones which have existed in a crowded thoroughfare. It always contained an immense variety of good and useful books, priced at exceedingly moderate amounts, and the poorer book-lover could always venture, generally successfully, on suggesting a small reduction in the prices marked without being trampled in the dust as a thief and a robber’. William Dobson Reeves retired to 28 Avenue Road, Prittlewell, Southend, where Emma died in 1902. Frank Karslake later went down to Southend to interview him for the first volume of ‘Book Auction Records’ in 1903. Reeves died a rather sad death in his eighty-second year on 17th March 1907: by now very frail he suffered bouts of unconsciousness, one of which caused him to fall on the fire. According to a report in the ‘Chelmsford Chronicle’, he died the following morning from the shock of the severe burns inflicted. Frank Karslake attended the funeral on behalf of the newly formed Second-Hand Booksellers’ Association (later to become the ABA) – ‘He was the doyen of bookselling, and one of its most highly-respected members’. One of the executors of an estate valued at £8,243.9s.5d. 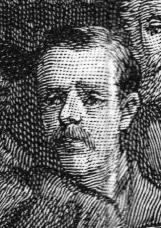 was another bookselling son, the third William Reeves (1853-1937), who had opened his own shop on Fleet Street as early as 1875. 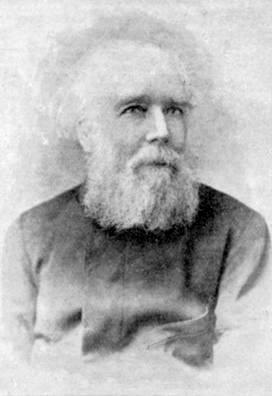 Although he published in other fields, including the authorised English translation of Karl Marx’s ‘Manifesto of the Communist Party’ in 1888, edited by Friedrich Engels (who was a customer), this William Reeves specialised in music, producing over 300 books in the field. Moving to the Charing Cross Road in 1900, the music firm was to prove long-lived, the company finally being dissolved as recently as 2002. (11) Lord Brabourne – standing behind Reeves and next to James Roche is the first private buyer we have encountered. Heavily bewhiskered and wearing a silk top hat is Lord Brabourne (1829-1893), or, to give him his full name, Edward Hugessen Knatchbull-Hugessen, 1st Baron Brabourne. The descendant of a long line of Kentish baronets, educated at Eton and Oxford (where he was President of the Union), Knatchbull-Hugessen was the Liberal Member of Parliament for Sandwich from 1857 to 1880. He served as a whip under Palmerston, becoming Under-Secretary of State for the Home Office in 1866, a position he held under both Lord John Russell and Gladstone. In 1871 he became Under-Secretary for the Colonies and in 1873 a Privy Councillor. In 1880 he was elevated to the peerage as Baron Brabourne of Brabourne. On becoming a peer he became a Conservative and joined the Carlton Club. 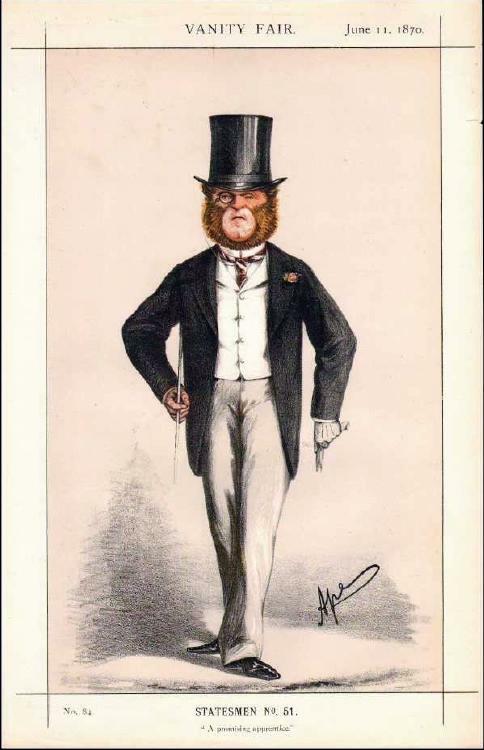 He was a man of sufficient national celebrity to feature in a ‘Vanity Fair’ caricature in 1870 – a study by ‘Ape’ (Carlo Pellegrini) looking almost like a satire on Darwin’s theory of evolution. In the world of books, he is far better known as the author of a successful string of children’s books and fairy stories, said later to have inspired the young Tolkien. 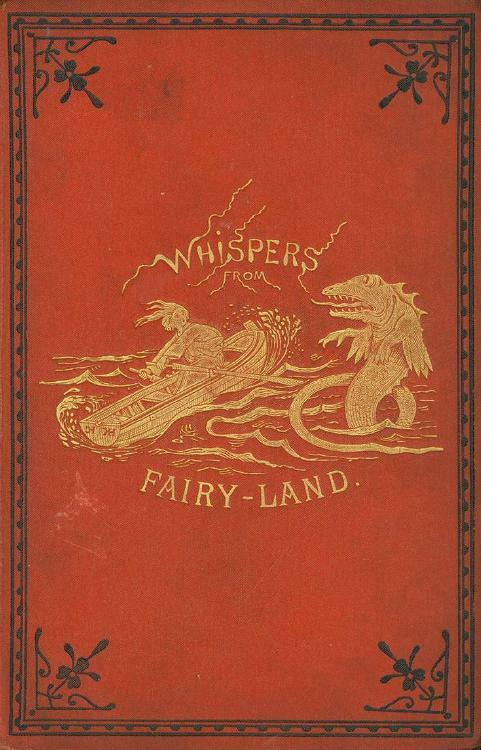 These included ‘Stories for my Children’ 1869; ‘Crackers for Christmas’ 1870; ‘Moonshine’ 1871; ‘Queer Folk’ 1874; ‘River Legends’ 1875 – illustrated by Gustave Doré; ‘Whispers from Fairyland’ 1875, etc. After the death of his mother, Brabourne inherited ninety-four letters written by his great-aunt, Jane Austen to her sister Cassandra. These he published as ‘Letters of Jane Austen’ in two volumes in 1884, with introductory and critical remarks ‘mainly notable for their diffuse irrelevance’ (ODNB). As his presence in the room suggests, he was also a well-known book-collector. 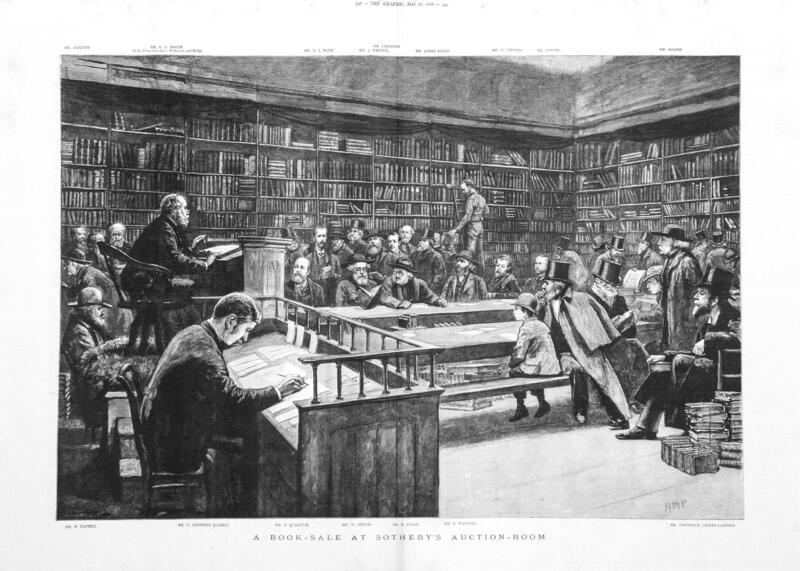 Part of his library, which ‘abounded in topographical works, scarcely any English county being unrepresented’, was held in May 1891, raising over £2,000. After his death in 1893, Puttick & Simpson dispersed the remainder in a three-day sale, issuing a ‘Catalogue of the Valuable Library of the late Rt. Hon. Lord Brabourne’. 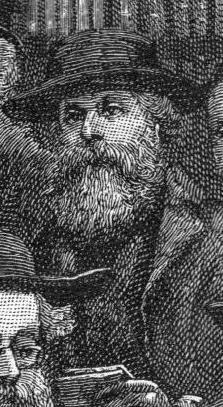 (12) Mr W. Ward – to Lord Brabourne’s right and mistakenly taken for James Westell by the editors of ‘The Graphic’ – a mistake rectified by both Roberts and Karslake – stands William Ward of Richmond (1829-1908), in a low hat. He must be the ‘William Ward (of Richmond)’, established 1875, who is listed in contemporary directories as a dealer specialising in fine art, illustrated books and prints, with premises at 28 Southampton Street, off the Strand. The ‘Sheffield Evening Telegraph’ of 9th June 1894 carried a report of him successfully offering a Turner watercolour of Sheffield to the corporation for £21. Unless I have completely the wrong man, his main occupation was actually as an artist himself, so describing himself on census returns, and exhibiting occasionally at the London shows. He was born at Thornton Heath in Surrey in 1829, married Augusta Ellen Clark of Newbury in the 1850s, and was living in Islington described as a ‘painter in watercolours’ with three young sons in 1861. After a spell in Twickenham, the by now rather larger family eventually settled at 2 Church Terrace, Richmond, where William Ward was to live until his death in 1908. 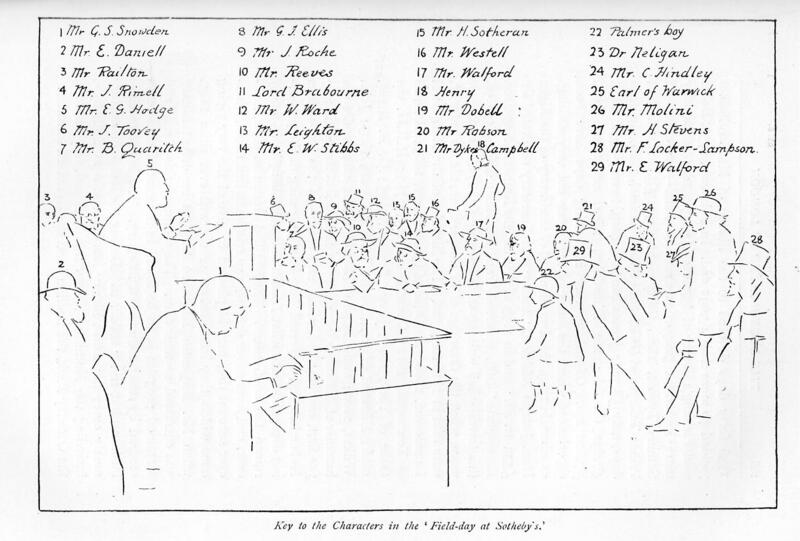 Probate on an estate valued at £3,566.0s.2d was granted to his second wife, Sarah Ward; a daughter, Helen Enid Ward, and his eldest son, William Clark Ward, who was himself a fine art dealer. (13) Mr. Leighton – to Ward’s right and looking rather worried, as well he might – he did not know it yet, but one day he was going to become President of the ABA – stands the bare-headed and rather nondescript looking figure of Walter James Leighton (1850-1917). I have written about Leighton before (see both the ‘Past Presidents’ section of the ABA website and the piece called ‘A Blocking of Leightons’ here on the blog), so I shall just quickly recap. Leighton was born into the very heart of the London book-trade, certainly the third and quite probably the fourth generation of a family of London book-binders. He was first cousin to the celebrated John Leighton (1822-1912), artist and designer, and the wider family almost certainly included Jane and Robert Leighton of ‘Leighton, Son & Hodge’, the well-known Victorian publishers’ binders, as well as the ‘Leighton Brothers’ (George Cargill Leighton, Charles Blair Leighton and Stephen Leighton), pioneers of colour printing. Born at Westminster on 2nd August 1850, Leighton was a son of the bookbinder James Leighton (1802-1890) and his wife Annie Fordham (1827?-1868), who had married in 1847. 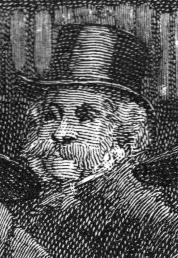 The immediate family firm had been founded by his grandfather John Leighton (d.1857), who had occupied premises at 40 Brewer Street, Golden Square, since at least 1819. It was here that Walter Leighton spent his early years – and indeed the whole of his working life. Walter’s mother died when he was just seventeen, by which time he was already training in the family business, which had by now diversified into book-selling as well as book-binding. In 1883 he became a full partner in the family business, which became ‘James & Walter James Leighton’ for a few years before reverting to the earlier ‘J. & J. Leighton’ style after his father’s death. 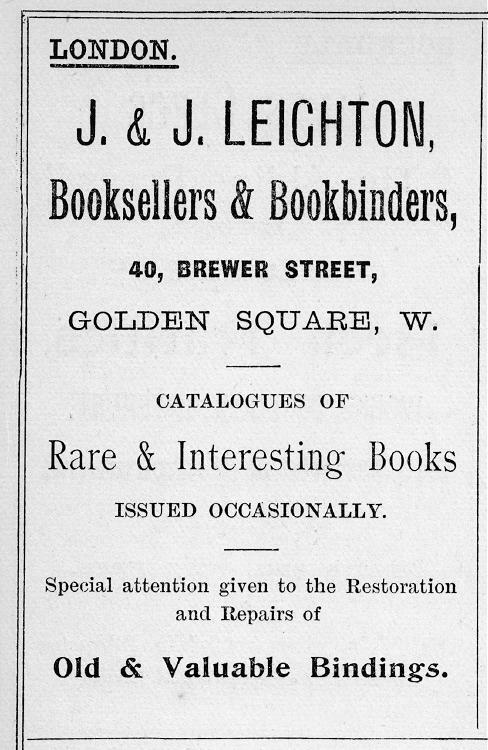 The business, which came increasingly to concentrate on antiquarian books, remained at 40 Brewer Street until Leighton died in 1917. Probate was granted on 8th August 1918 – his effects stated at the staggering sum (by book trade standards) of £344,392.15s.4d – nine times greater than the sum left by Quaritch, twelve times greater than Toovey, and vastly more even than Edward Grose Hodge. Far greater too than the estate of Lord Brabourne, which was valued at under £14,000 in 1893. Perhaps time for a re-evaluation of the pecking-order in the late Victorian and Edwardian trade: the ledgers and stockbooks of the firm for the period 1896 onwards are held by the British Library. The business survived until 1937 – at various times its customers had included Gladstone, Carlyle, Michael Faraday, Sir William Osler, William Morris and Lord Birkenhead. This entry was posted in ABA Past Presidents, Book Collecting, Booksellers, Bookshops, Forgotten Authors and tagged Edward Hugessen Knatchbull-Hugessen, Lord Brabourne, Sotheby's, Walter James Leighton, William Dobson Reeves, William Ward of Richmond. Bookmark the permalink.